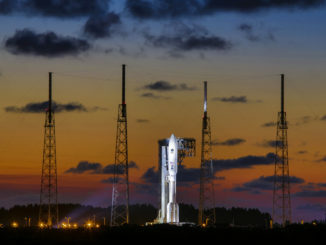 A nuclear blast detection satellite and an assortment of experiments will be boosted directly into geosynchronous orbit 22,300 miles above Earth in 2019 by the most-powerful version of United Launch Alliance’s Atlas 5 rocket, the Air Force has decided. 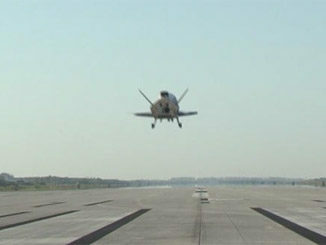 This gallery of U.S. Air Force photos show technicians, wearing protective SCAPE suits, initially check for hazardous hypergolic fuel vapors around the X-37B spaceplane on the Shuttle Landing Facility runway and the subsequent tow of the vehicle to its newly-renovated hangar at the Kennedy Space Center. 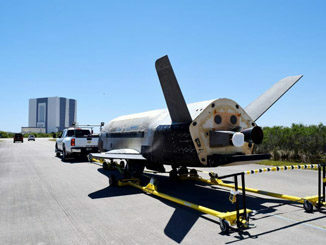 The U.S. military’s mini space shuttle successfully returned to Earth today, touching down on Runway 15 at the Shuttle Landing Facility after spending 718 days in space. 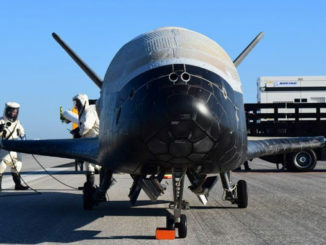 The Air Force’s robotic X-37B mini space shuttle swooped out of obscurity today after 718 days spent in orbit on a secretive military mission, touching down at the Kennedy Space Center’s orbiter runway on autopilot, the military announced on Twitter. 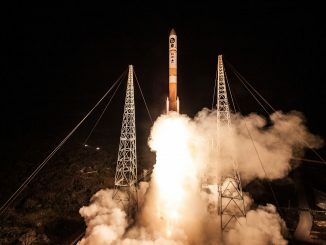 The 377th Delta rocket begins its journey to space carrying a military communications satellite funded by Canada, Denmark, the Netherlands, Luxembourg and New Zealand in a deal that gives the allies access to the U.S. military’s worldwide Wideband Global SATCOM system. 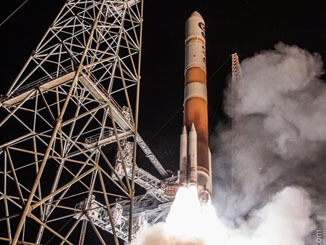 The United Launch Alliance Delta 4 Medium+ (5,4) rocket lifted off at 8:18 p.m. EDT (0018 GMT) from Cape Canaveral in service to the U.S. military’s Wideband Global SATCOM communications satellite constellation. 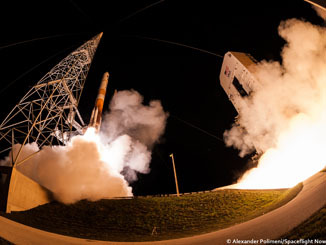 Launching the Wideband Global SATCOM 9 satellite purchased by allied nations in collaboration with the U.S. military’s worldwide communications network, a United Launch Alliance Delta 4 rocket thundered away from Cape Canaveral at 8:18 p.m. EDT (0018 GMT). 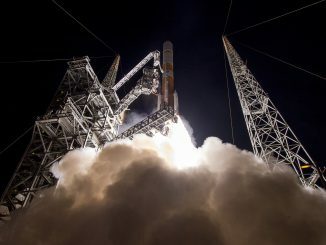 With an international flair for collaboration, a military communications satellite jointly purchased by five allies was rocketed in space Saturday to further expand the U.S.-operated network that serves battlefield forces anywhere on Earth. 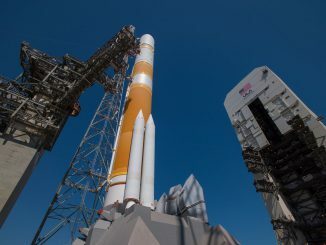 The United Launch Alliance Delta 4 rocket, standing 217 feet tall and weighing 900,000 pounds, unleashes 1.8 million pounds of thrust from its main engine and four side-mounted boosters at 8:18 p.m. EDT Saturday (0018 GMT Sunday) to launch the ninth Wideband Global SATCOM satellite for U.S. military and allied communications. The 330-foot-tall mobile service tower is rolled away from the United Launch Alliance Delta 4 rocket at Cape Canaveral’s pad 37B in the hours before the scheduled liftoff. 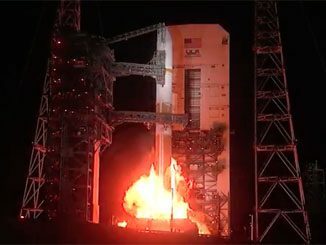 The 9-million-pound gantry was retracted the length of a football field in preparation for launch of the Air Force’s WGS 9 communications satellite into Earth orbit.